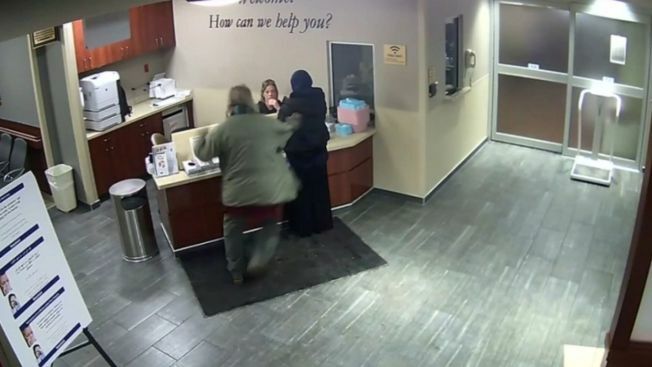 Surveillance video shows a 19-year-old woman wearing a hijab being attacked while checking into an emergency room in Michigan. WDIV's Shawn Ley reports. A 19-year-old woman is suing the Michigan hospital where surveillance video captured her being attacked by a man while checking into the emergency room. The victim was punched in the head by a man who was waiting in the lobby of the Beaumont Dearborn emergency room on Feb. 10. The attacker had been discharged from the hospital earlier that day. Reports say he bothered other patients and attempted to wander down hallways. Security told him to sit down before he punched the woman who was wearing a hijab. The victim is now suing the hospital, saying she has had emotional distress after being knocked out in the incident.